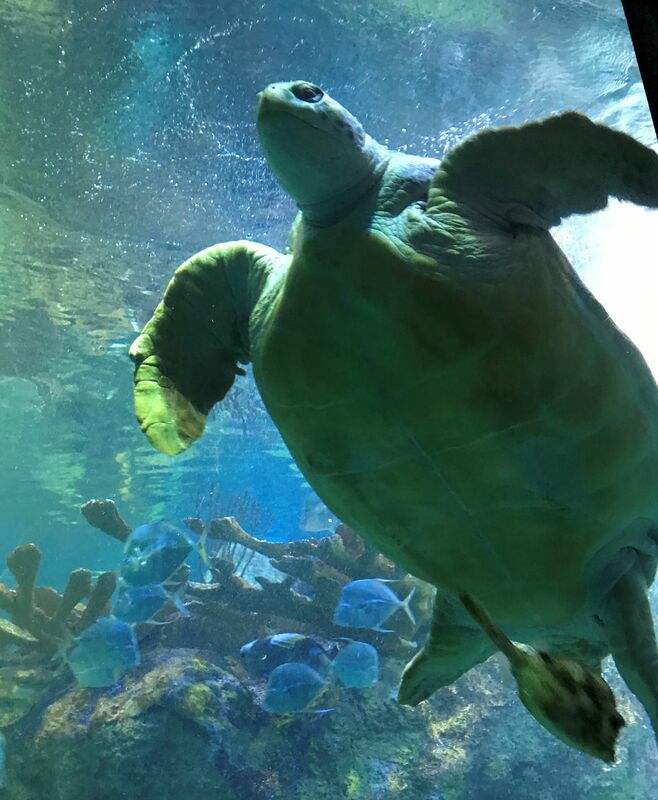 How to spend the entire day at The New England Aquarium without spending a lot of cash. I really wanted to go to the Boston Tea Party Museum. We had just finished studying about it, and one of the perks of living close to Boston was that this type of historic site was an easy field trip. However, the day before we were slated to go, that museum closed due to the extreme cold and wind chill of the "Polar Vortex." Since it looked like it was going to be just as cold the next day, I decided to change tack. One way we tried to cut costs for the day was to use the coupons that many libraries carry. Regular admission was $27.95 for adults (me) and $18.95 for children 11 and under (my student). That was almost $47! The New England Aquarium coupon was good for $10 admission for each of us—an excellent deal. I encourage you to check your local library for discounts on museums. Rather than pay almost $30 to park, my favorite Uber driver (my husband, who sometimes moonlights as an Uber driver) offered to drop us off. He would then head to work and pick us up at the end of the day. It seemed like a good idea, but who knew that a disabled dump truck blocking the Pru tunnel on the Mass Pike would cause a 45-minute delay? Despite the setback, we got there well before 10 AM. For the first hour or so, we had the place to ourselves. 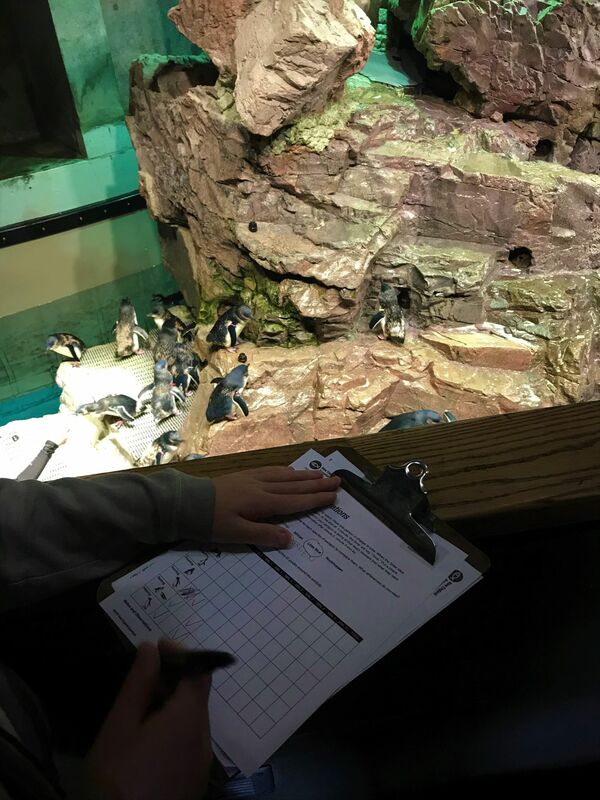 Three different species of penguins were at the lowest level of the aquarium and watching their antics were a great way to start the day. 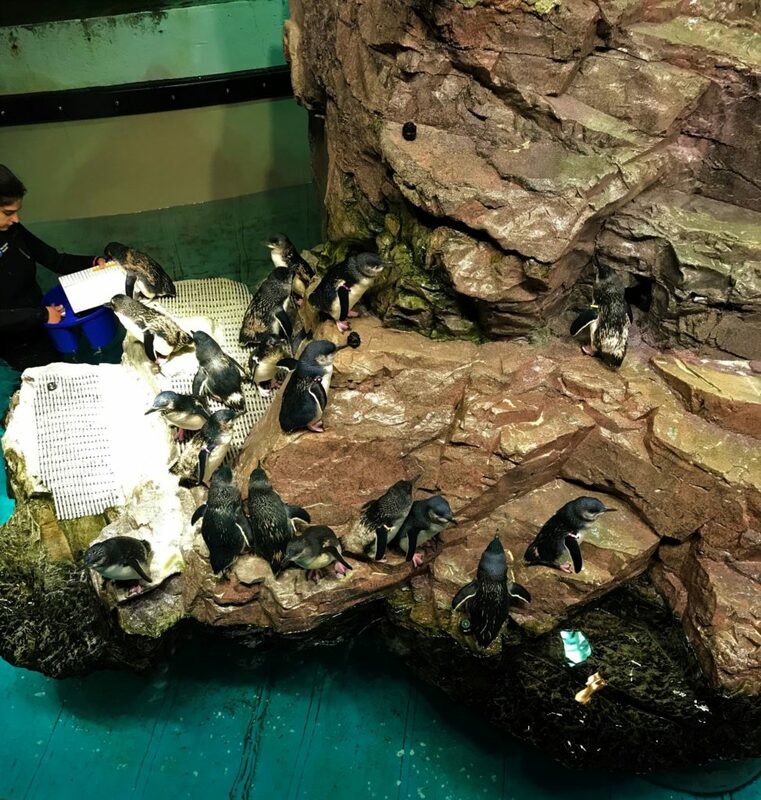 The night before, we had scanned the available educational resources available on the aquarium's website. My student found the penguin observation chart. 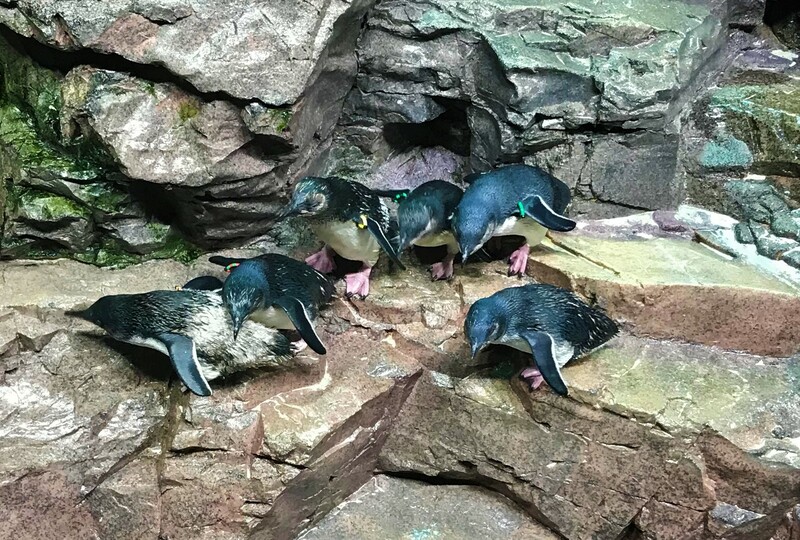 He observed an individual little blue penguin (the one on the top right with the green identification beads on his wing) for ten minutes, recording his activities on the chart. After that, we just wound our way upwards to the upper levels. 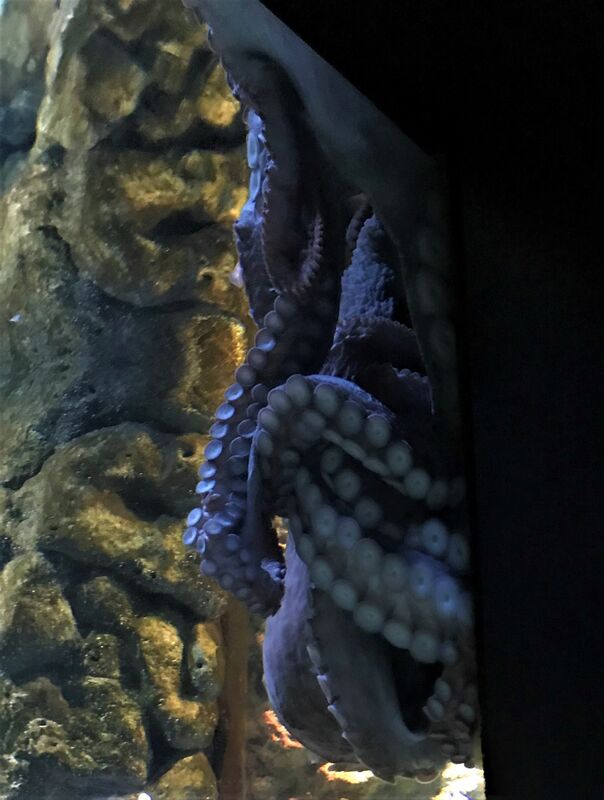 The Giant Ocean Tank filled the middle of the aquarium, with myriad smaller tanks all around. Lingering at one of the smaller tanks, my student was determined to find a miniature crab. We waited and watched. Nothing. 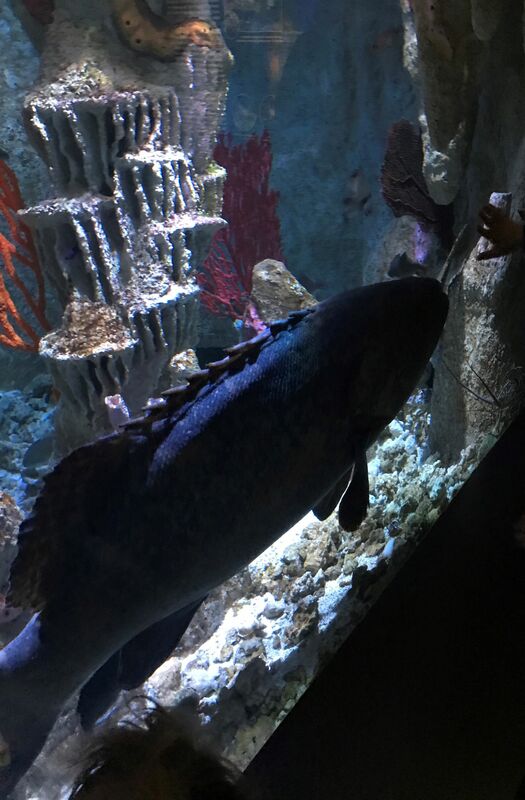 But then he noticed the elephant in the room, or, rather, the goliath grouper in the tank. It was huge and lumbering but seemed quite at home in the cramped quarters. 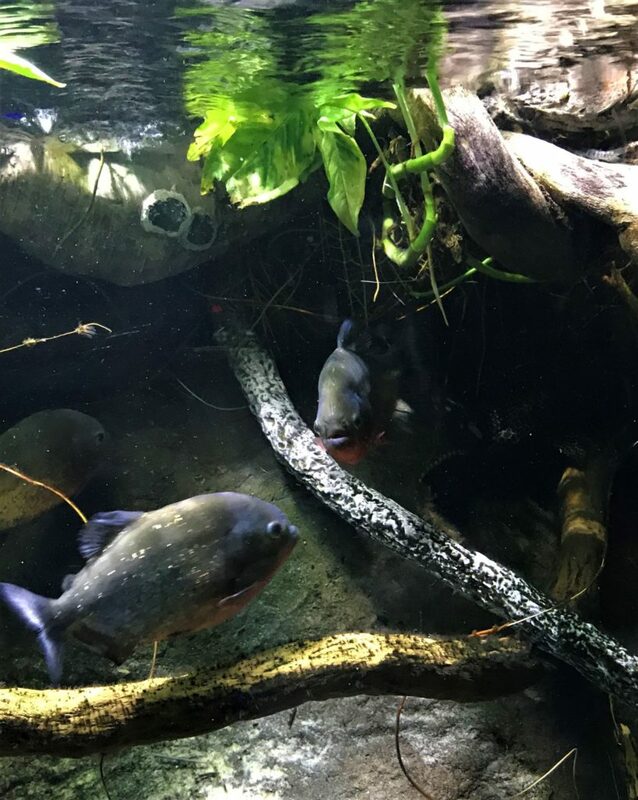 We were amazed to see it emerge from its preferred place in the back of the tank and easily navigate around the rocks and other fish. ...and in another, there was a huge snake: an anaconda! My student reported three snakes, but I have a feeling it was all the same snake. Notice the discarded snakeskin floating on the left. Yikes. The one thing I wanted him to see, but he wanted to avoid, was the jellyfish. 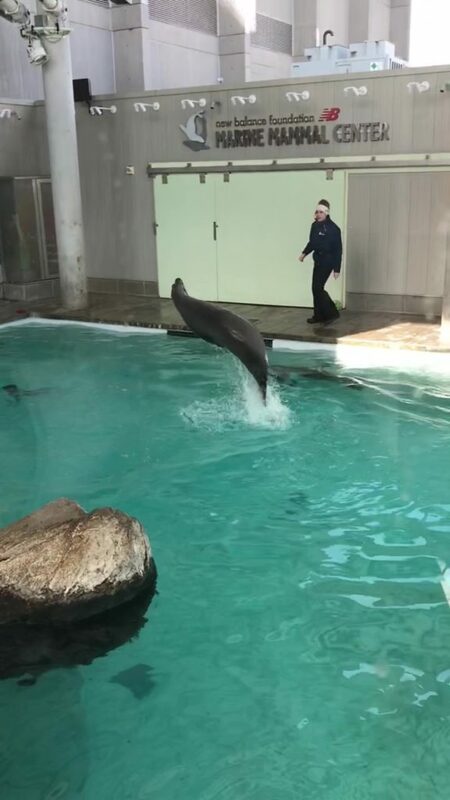 When we got to the display, though, he immediately struck up a conversation with one of the aquarium educators about how he got stung by a jellyfish when he was little. 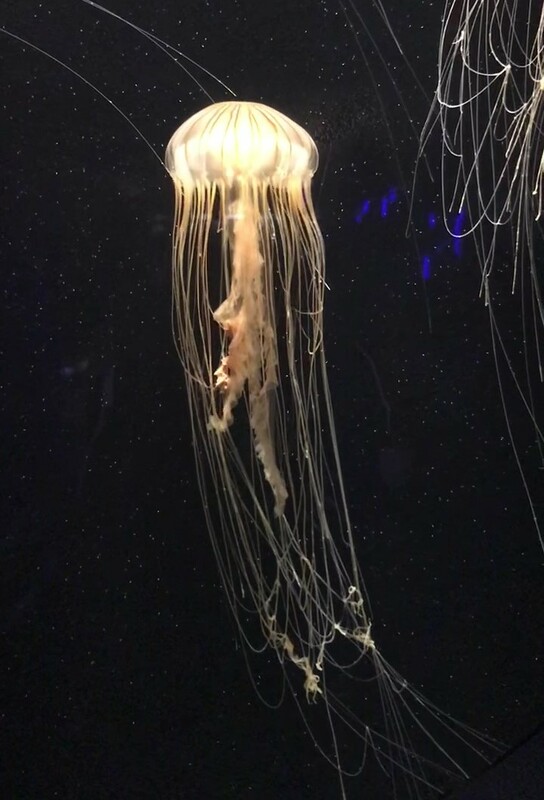 When my student was almost five, we were on vacation in Texas and he stepped on a jellyfish while running on the beach. I wasn’t with him at the time, but I heard about it later. I had always pictured a jellyfish the size of his hand. But it was much bigger, about the size of a hub cap. The things you find out! These trips can be very educational! It has been like that this year. At random points during our school day, my student would suddenly start reminiscing. "You know what I remember...," he’d begin. And then he'd tell me a story that I hadn’t heard. At first, I would be annoyed, thinking it was a delaying tactic, and I would try to get us back on track. But now I let him talk. After all, one of my goals for this year is to really find out what makes this boy tick. I think I need to be educated more than he does. We passed by a few more displays and paused at those that caught our eye. We were having salmon for dinner that night. My student approved. 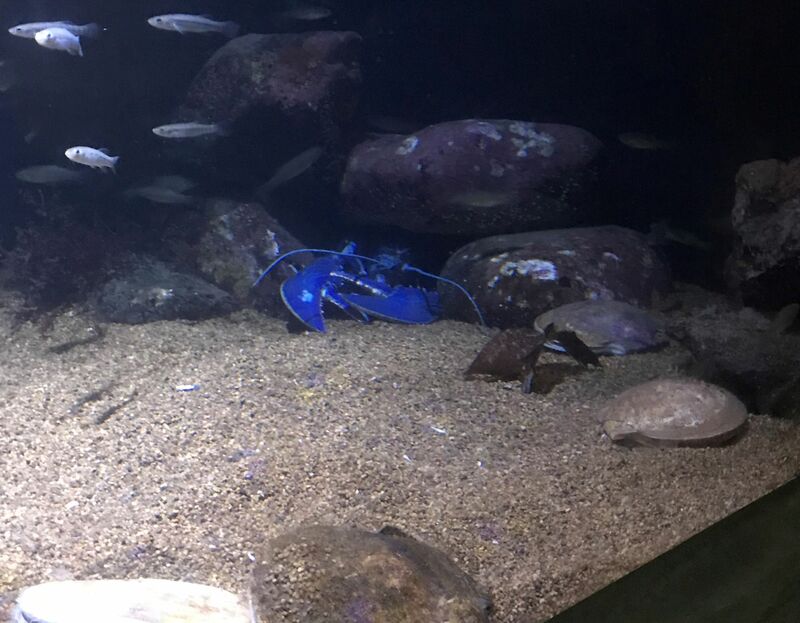 And this blue lobster was certainly eye-catching. We had just seen a cooking show with sea urchin as the main ingredient. Exotic! As the day wore on and he gained confidence, my student increasingly would point things out to others if he thought it might help someone. 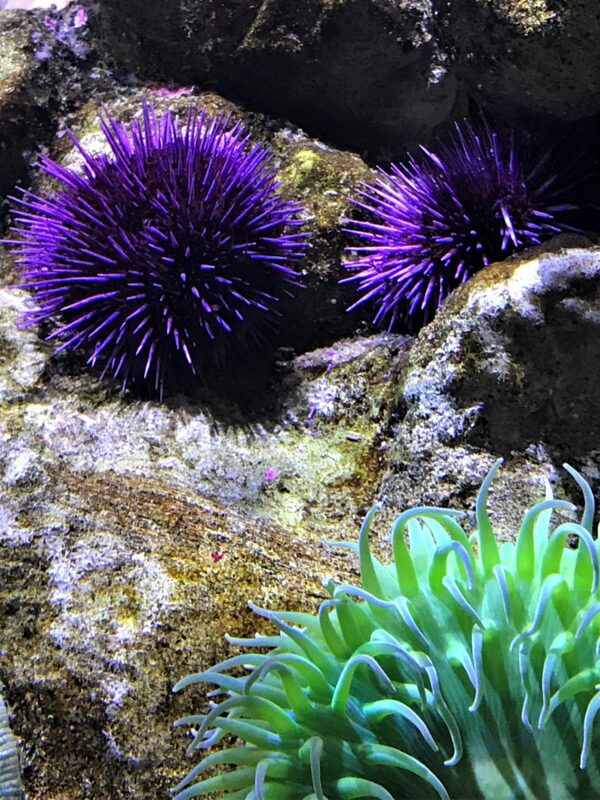 Before lunch, we stopped at the touch tank. 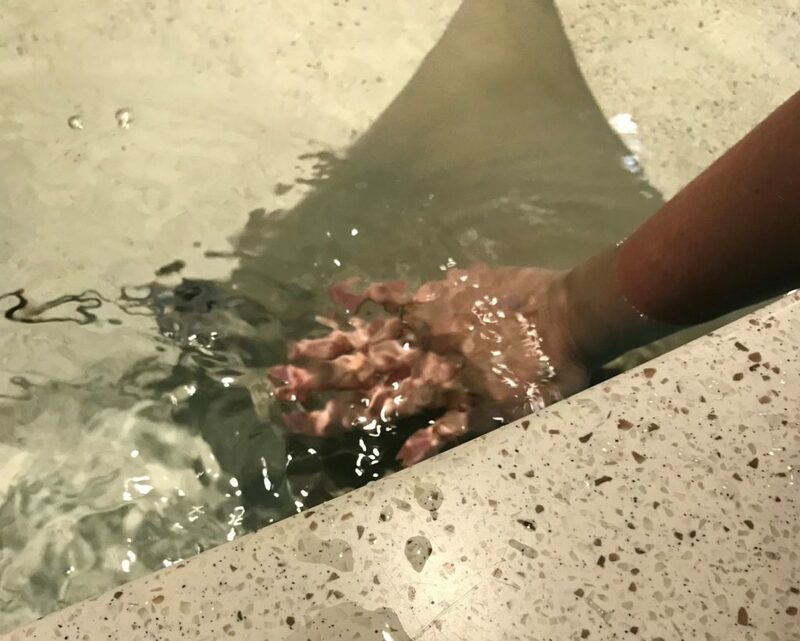 My student didn’t want to have anything to do with it, but here’s a picture of my hand brushing up against a ray. I had made an executive decision to buy lunch rather than lug it around all day. The snack bar was small but it had a wide variety of food, from pizza and smoothies to different kinds of sandwiches, all with pretty reasonable prices. I thought it might be good to break up the day with an IMAX show. The library coupon only gave a discount on admission to the aquarium, so we still had to pay the full price for the show at $9.95. The one we picked, Great White Shark 3D, didn’t start for 30 minutes and we hadn’t yet seen the seals and sea lions outside. We got there just in time to see them perform. Perfect timing! Usually, I am a planner and work the schedule to try to fit in everything possible in the most efficient manner. But this day was for my student. We went at his pace and saw what he wanted. It was nice to be reminded that even without planning, it’s possible for everything to work out. We got to the theatre plenty early to get a good seat. Ha! Only a handful of people joined us. 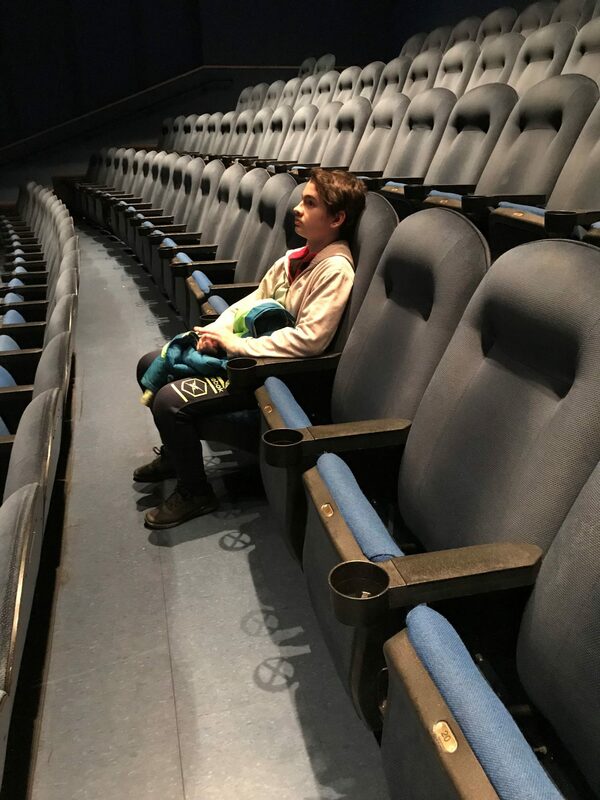 It was practically a private screening. We probably would have gone home then, but our Uber driver was still at work about an hour away. We looked at the map to see what we had missed. Neither of us remembered seeing the octopus or the shark exhibit, plus we hadn't yet checked out the gift shop. We headed to the gift shop and planned what we might buy later. When I was my student's age, it always meant a lot to me when my parents would let me pick out a souvenir. We saw people picking up photos near the gift shop. 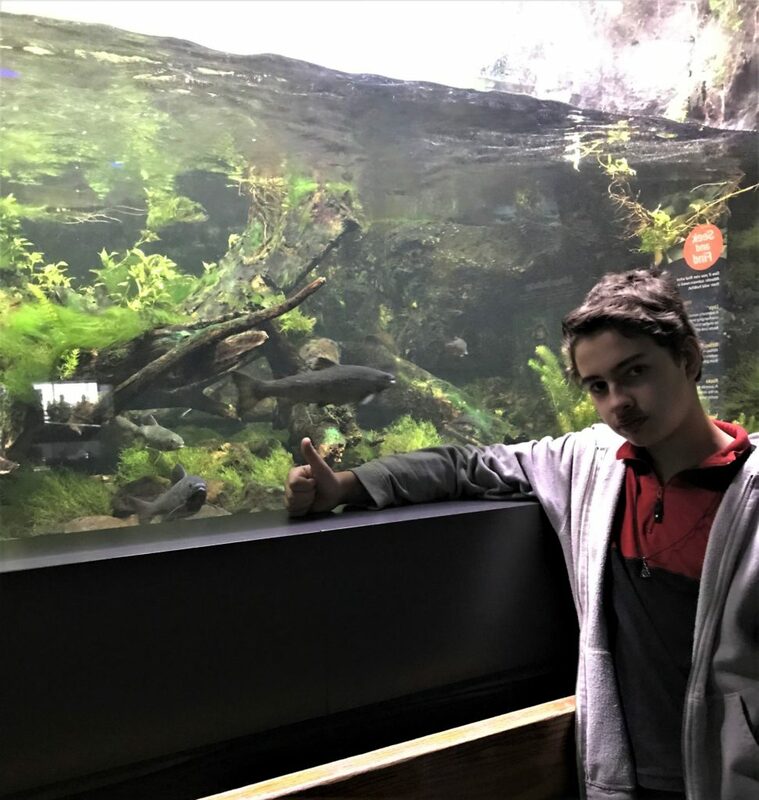 When we had first entered the aquarium, they had taken our picture and handed us a ticket with vague instructions on where to turn it in for a photo. I guessed this must be the place and handed one of the attendants our ticket. Nowhere were prices displayed, nor was there any indication that there was some charge for the photo. I was familiar with theme parks where they take your picture during a ride and then present you with an image which you may keep for a fee. This wasn’t Disney, but I knew it wouldn’t be cheap. When my student asked me, I estimated it would be about $20. The suspense built while the person behind the desk worked their magic. Since they took our picture in front of a green screen, they could put us in a number of different scenes. Plus one of the pictures was us holding our hands out like we were holding a tray. We didn't realize why when they took our picture. Finally, they presented us with a picture of us on a beach and another with a fish background. In one of them, it looked like I was holding a penguin. They were super cute. We still had the option not to buy them, but it was hard to resist. They had two price points, $40 for two photos or $50 for two photos and a bunch of mini photos. My student said, “Mom, you were right!” It was nice to be right. The whole psychology of it was interesting. They counted on the element of surprise, that we would be so taken with how cute the photos were that we would be willing to spend $40 or $50 for a one-of-a-kind package on impulse. I wasn't so inclined. My student agreed; he’d rather get something from the gift shop. 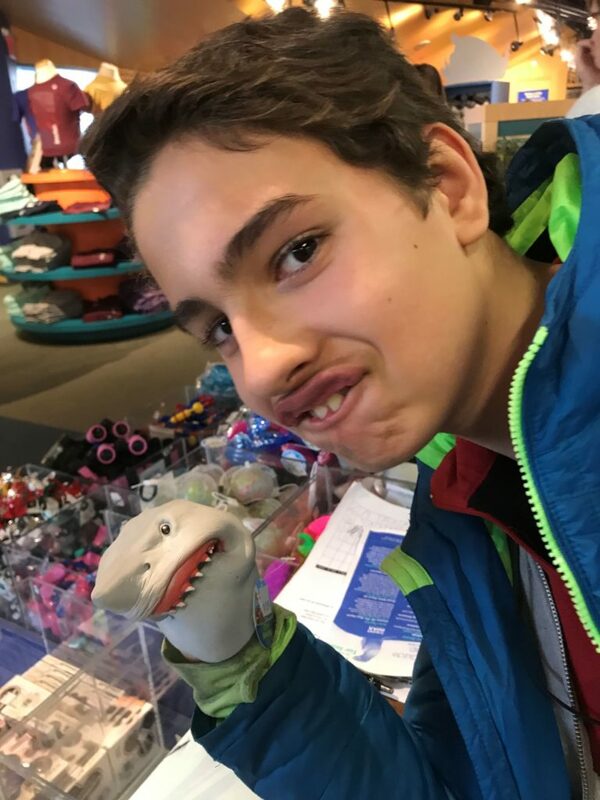 We settled on the shark puppet. 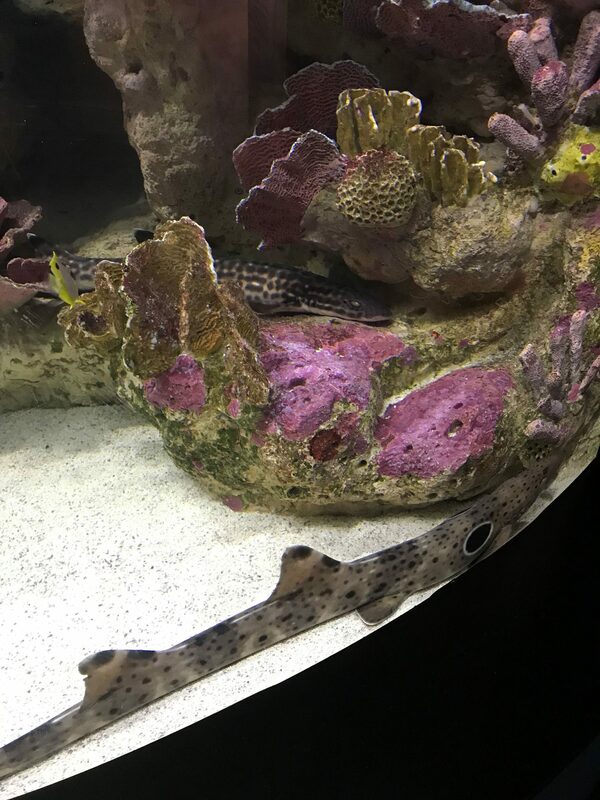 We named him “Socially-Awkward Shark”. I must say, every employee was there to make sure we had a good time and was truly professional. 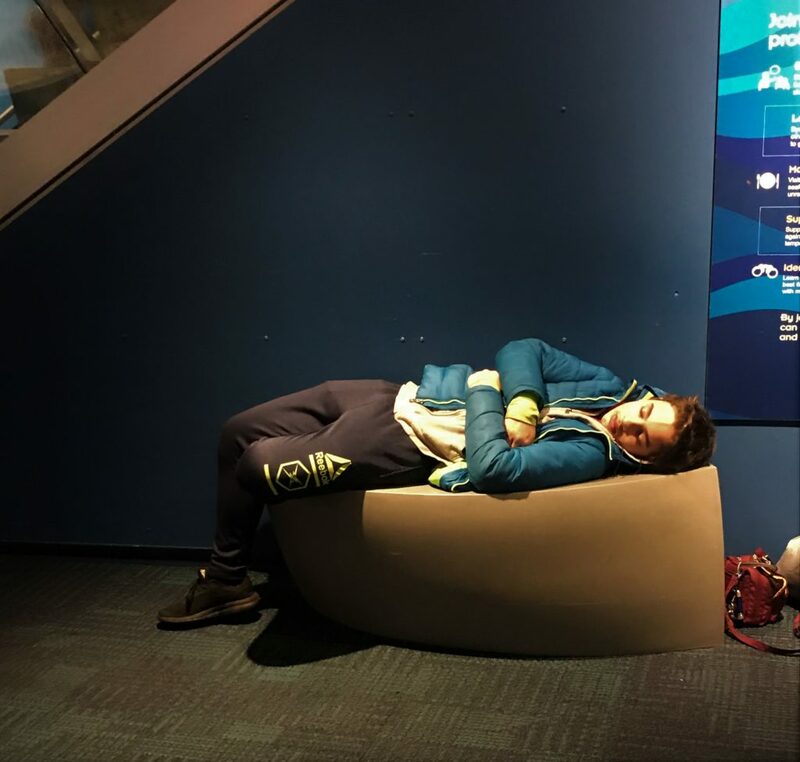 The only criticism I might have is there wasn’t a lot of seating throughout the aquarium. I felt like they expected us to keep moving and not take up space. I guess that’s fair. The cafeteria area had chairs, but when it closed at 3 PM, the cleaning crew put them up on the tables. While we were waiting for our Uber driver, it was not easy to find a comfortable place to sit. 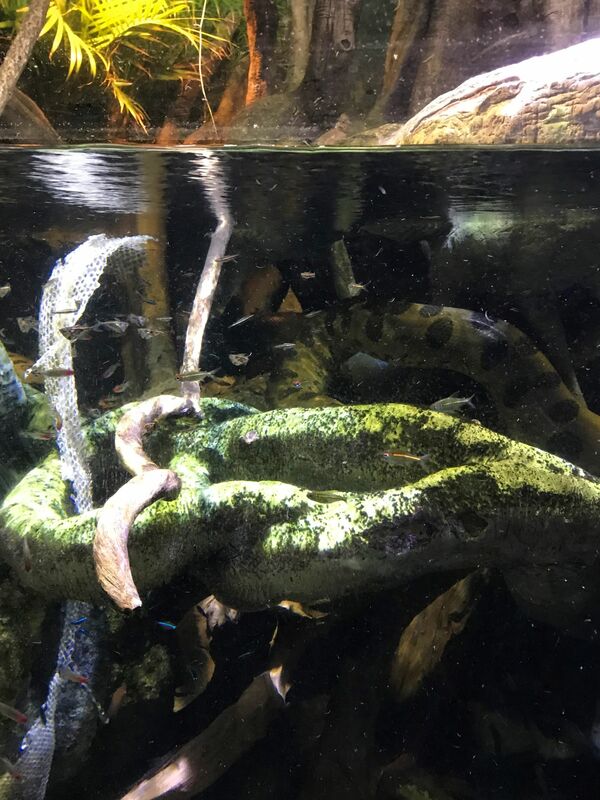 At our last stop, which was the shark exhibit, on the lower level under the touch tank area, even the sharks thought it was nap time. We found a spot where we were both able to recharge: my student slept on a bench, while I plugged my phone in. A whole day of learning with and learning more about my student: Priceless.